You know singer Luis Arriaga from Luis and the Wildfires and the rest of the Dragtones from the Hives, the Barbwires and the Hi-Winders, and so lemme tell you even with that formidable rock ‘n’ roll resume: this is the album where they let go and really freak out. 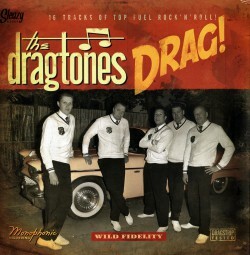 If you gnawed the Dragtones down to the bones, it would be Luis, insane and shouting loud enough to pop a sinus while a Swedish guy chops out solo after bleeding solo, and that is pretty much all a human can demand from a musical endeavor ever. You know how bloodthirsty Gerry Roslie sounds when he lurches into a new verse? That’s where this starts. Opener “Beware” is like amped-up Downliners Sect, “Tough Enough” jumps off the first dinosaur chords of “The Witch,” while “Sharmane” is like Lyres/DMZ-style cranked-up mono-punk and ah, just listen to ‘em carom off the walls during the solo. You can physically sense the band just lift up and go nuts so many times here—if you’ve ever personally lost it a little just seeing a band play, well, that’s what they were doing with each other as they recorded this. You can’t be a “–tones” band without a few agile instrumentals, which appear here doing honor to the memory of Dale Hawkins’ guitar tone, and if you decide to pry this thing apart looking for detail and subtlety, that’s where you’ll find it. (“A Little Bit of Both.”) But let me direct the rest of you psychos right to the raw meat. (“Move a Little Faster,” the Esquerita-style smasher “Baby Jane.”) Closer wind-down instro is like watching a dying eye slowly close. Good work, you lunatics.